We introduce the concept of a socially-adaptable interface, an interface that provides instant access to task-specific interface customizations created, edited, and documented by the application's user community. 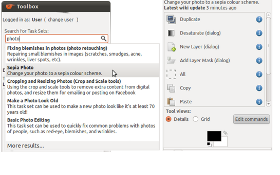 We demonstrate this concept in AdaptableGIMP, a modified version of the GIMP image editor that we have developed. Benjamin Lafreniere, Andrea Bunt, Matthew Lount, Filip Krynicki, and Michael A. Terry. 2011. AdaptableGIMP: designing a socially-adaptable interface. In Proceedings of the 24th annual ACM symposium adjunct on User interface software and technology (UIST '11 Adjunct) 89-90, poster.